Beauty Professor: Marc Jacobs Re(Marc)Able Full Coverage Foundation Concentrate--Swatches of 12 Shades! 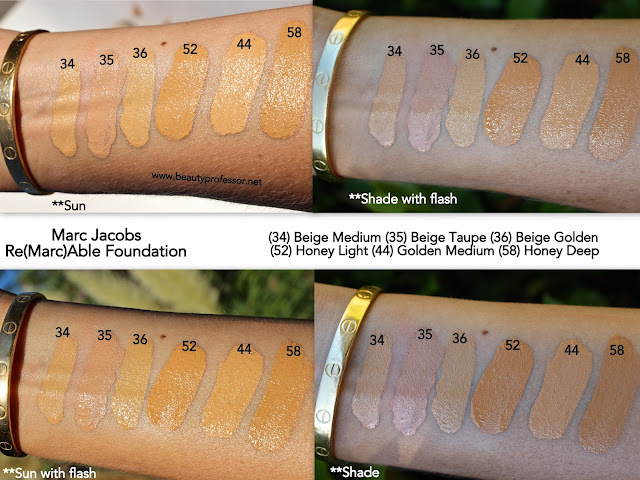 Marc Jacobs Re(Marc)Able Full Coverage Foundation Concentrate--Swatches of 12 Shades! Above: 12 shades of Marc Jacobs Re(Marc)Able Full Coverage Foundation Concentrate. Happy September, lovelies! Last month, I reviewed the Marc Jacobs Re(Marc)Able Full Coverage Foundation Concentrate (HERE) and demonstrated application of the formula HERE. 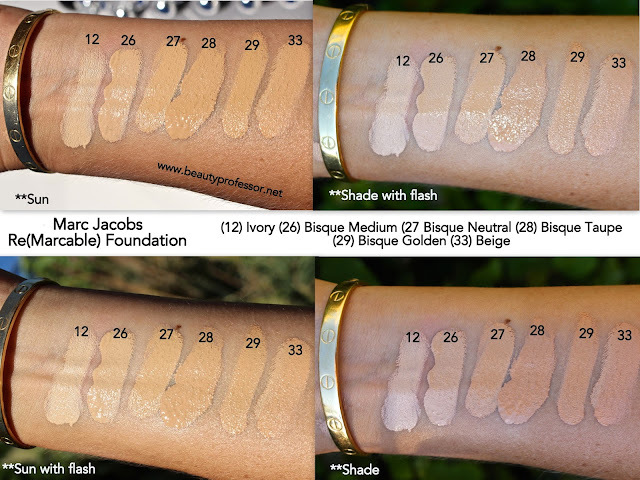 After receiving a host of requests for additional shade swatches, I am happy to report that I have a total of 12 different shades (there are 22 in all) in the fair-light through medium-dark range! All in all, is an excellent option for those seeking natural and lasting full coverage! Above: The foundation is housed in a frosted glass bottle and features a glass dropper to precisely distribute drops of the formula. Above (from L-R): #12 Ivory, #26 Bisque Medium, #27 Bisque Neutral, #28 Bisque Taupe, #29 Bisque Golden and #33 Beige. Above (from L-R): #34 Beige Medium, #35 Beige Taupe, #36 Beige Golden, #52 Honey Light, #44 Golden Medium and #58 Honey Deep. By Terry Terrybly Densiliss Compact Contouring 200 Beige Contrast, applied to cheeks for contour and highlighting. I am so over the moon for this latest release from By Terry. 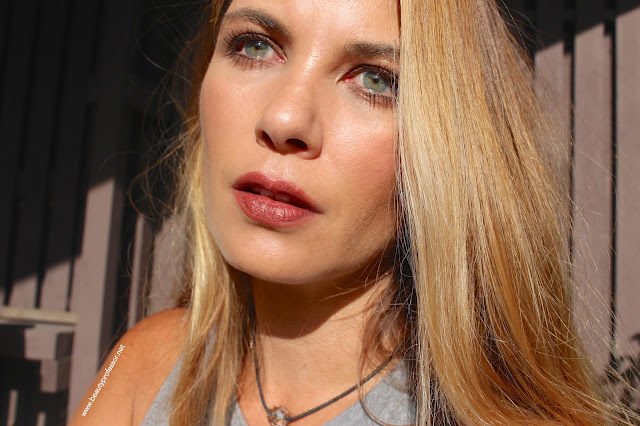 The exquisite contouring powder is a medium brown with no shimmer (compare with Burberry Earthy, reviewed HERE) and the highlighting powder delivers radiance without being shimmery...a true feat! A closeup of all of the powders in this marvelous range coming up soon! La Prairie Cellular Radiance Cream Blush in Plum Glow (reviewed HERE)...tapped on the apples of my cheeks for a subtle flush, I am loving this mauve shade for fall. Giorgio Armani Luminous Silk Compact in #4 (included HERE) in the T zone. Gucci Magnetic Eyeshadow Duo in Aristocratic (reviewed HERE)...both shades blended on upper lids and lower lash line. 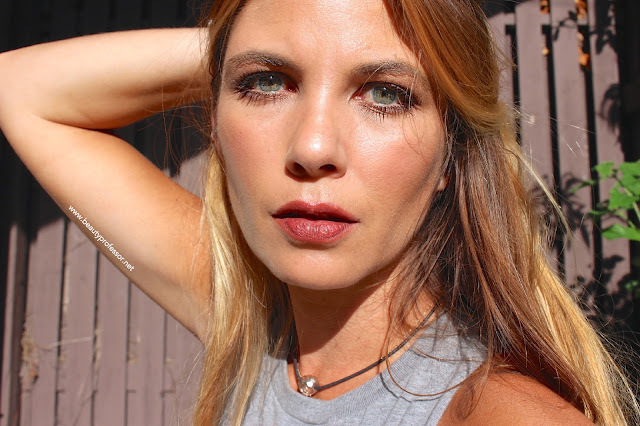 Charlotte Tilbury Matte Revolution Lip Color in Birkin Brown (pictured and swatched below)...this deep brown mahogany shade is definitely darker than I generally wear, but I love the rich hue and velvety finish. Perfectly wearable for fall! I have other shades in this formula and cannot wait to share swatches and looks in the very near future. Above: Charlotte Tilbury Matte Revolution Lipstick in Birkin Brown. Above: Products for a flawless canvas. Above: A truly exquisite light contouring option from By Terry. Above: Sunlit and ready for fall. Bottom Line: I hope you found the additional shade swatches of the Marc Jacobs Re(Marc)Able Full Coverage Foundation Concentrate to be helpful in your quest for most befitting match. Although I have quite a collection of foundations at my disposal, I am happy to confirm that this formula is consistently in my regular rotation. Have YOU tried this foundation? Thoughts? Good things ahead, including my closeups of the new By Terry contour powders, Charlotte Tilbury Matte Revolution lipsticks and a host of fresh fall releases; my teaching schedule is back in full swing now but, as always, I'm committed to sharing beauty discoveries in earnest frequency! Lovely post. I've been using the new Marc Jacobs foundation since it's debut. I absolutely adore it. As you said, it really does hold up to the humidity. I will repurchase. Now I'm curious about the byTerry contour powder. Especially as I don't always want shimmer. I must add that you look beautiful. I am thrilled to hear that you are loving the new MJ foundation and hope that you've been able to take a peek at my By Terry powders post now ; ) There are a few good shimmer-free options! I adore Birkin Brown on you along with Plum Glow. Great combination. Thank you, thank you, my friend! Yes finally! Thank you for so much for the swatches! I got samples of Golden Beige and Golden Medium. As showed in your swatches, they are indeed similar shades, along with Beige Medium I think. I always find Marc Jacobs shades confusing but this is definitely a good formula. I'll play with my samples to decide a shade, (or two? :P). The Charlotte Tilbury Birkin Brown looks so good on you!! I'm looking forward to your reviews on more shades. Hope you are having an amazing start for new semester, Professor! So glad you are enjoying the swatches and I hope you've been able to determine your perfect match now! I purchased the Marc Jacobs foundation, but I did not like it. I was very disappointed even though the lightest shade was spot on. It could be that I should have also purchased the primer, because the foundation sank into my pores, and it also seemed very drying even though I prepped with moisturizer. My skin is very dry though, and foundations that work for many people, often look terrible on me. Hi Anon...thanks for weighing in on this. This foundation is great but I can see it being tricky with drier skin...thank goodness we have such an amazing array of foundations available to suit each need. Have you tried the Koh Gen Do Aqua Foundation? It's incredible for drier skin! I can't wait to see your review on the new By Terry powders. I have my eye on them, but am still undecided on which colors to pick. Thank you for these! So glad to see these. Many thanks, Veronika!! I so appreciate your kind and supportive words. I will see what I can find out about the MJ foundation's availability in the UK! hey! lovely review on the marc jacobs foundation. But lately I found another shade called Golden deep 46 or 86 idk exactly, could you please swatch it? thnks!! Thanks! I don't have access to those shades right now but if I run across them, I will. youre so pretty!! thankyou for the swatches, so which shade would you recommend for aMac nc42? Thanks! I would recommend #52! How does this Marc Jacobs foundation compare to the Sensai Cream foundation ? It is more liquid than the Sensai and offers more intial coverage (full vs. medium). I would also deem it slightly more matte in finish! Hello BP! Thanks for the swatches. May I as which shade do you recommend if I wear the Kevyn Aucoin Sensual Skin Enhancer in sx06. I need very, very yellow undertones, that's why s SSE is my perfect shade. Thank you very much! My pleasure! I would recommend #29 Bisque Golden! MJ definitely didn't include darker colors in this new foundation line. Sure there are lighter complexions in each ethnic group but he totally omitted (Blacks/Asians/Mid Eastern/Hispanic) women of darker complexions. Actually, he did! I was only sent 12 shades but there are 22 in all and he has suitable shades on both ends of the spectrum, including a couple of gorgeous rich browns called Cocoa Medium and Cocoa Deep! 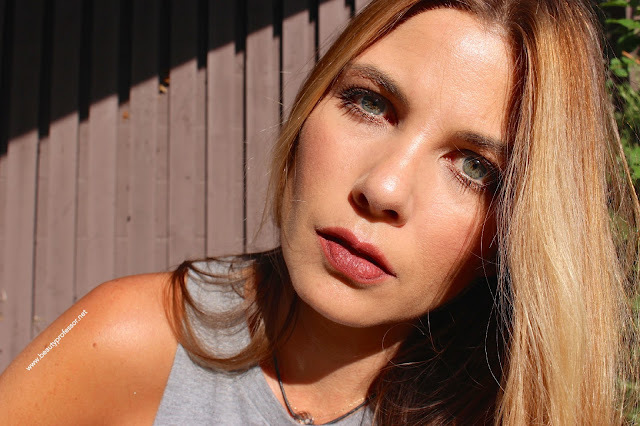 Take a peek on the Sephora or Marc Jacobs site to see what I mean! Love your review very helpful, what shade would you recommend for a nc30? Thanks, Monis...I would recommend Beige Golden! Thank you for your swatches, you habe always been the first and best in swatching the morst wanted foundations. Can you please help me pickung up the right shade in the remarcable foundation. I am Y315 in the new makeup forever ultra Hd Foundation, so which shade should i get ?! Please answer soon thank you. My pleasure, Anon...thanks for the compliment! With regards to your question, I would suggest #29 Bisque Golden. Love this!! I am 5 in luminous silk and fawn in tom ford, I ordered 29 in this but haven't received it yet, what color would you match closest to luminous silk and tom ford? I would recommend #27 or #29...hope your order was the perfect match! I would recommend Honey Light! Thank you so much for putting in the matching MAC color codes NC15, etc... I haven't used MAC foundation in ages, but it's still the easiest way for me to figure out what shade I am in other foundations!!! Looking forward to trying this. You have helped me decide to try the #26.